Lost in a mess of inconsistent and unclear research jargon? The National Center for Advancing Translational Sciences’ (NCATS), the ITM’s parent organization, can help translate. 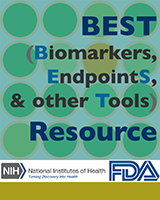 BEST (Biomarkers, EndpointS, and other Tools) Resource is an online glossary co-developed by the Food and Drug Administration and NIH that clarifies terms used in translational science and medical product development. BEST works to improve clarity and consistency in research language to get researchers on the same page and help studies move more smoothly and efficiently.